Philadelphia Chapter — Latin Liturgy Association, Inc. SUPPLICATION O Lord Jesus! true Light of the world, enlighten the eyes of my soul, that I may never be induced by the evil one to conceal a sin, through false shame, in the confessional, that on the day of general judgment my sibs may not be published to the whole world. Strengthen me, O Jesus, that I may resist the arms of the devil by a penitent life, and especially by scorning the fear of man and worldly considerations, and guard against lapsing into sin, that I may not be lost, but through Thy merits maybe delivered from, all dangers and obtain heaven. The indefatigable blogger Fr. Dwight Longenecker is at it again. In a new article from March 15, 2019, entitled “Tradition is the Democracy of the Dead,” he writes to assure us that he is a lover of tradition — but not excessively. He rightly says one should be or become Catholic for the sake of its 2,000-year-old tradition — or, more accurately, its 4,000-year-old tradition, since the law, prophecies, and worship of Israel are fulfilled in the Church. But he also says that, since tradition is not static or unchangeable, we need to be willing to change with the times, according to the judgment calls emanating from Rome, and not make an “idol” of the past. Well, one can certainly live free of fear that today’s Rome is in danger of making an idol of the past. One might rather fear its making an idol of the present or of the future. This all too easy reduction of one’s opponents to idolaters, which is one of the characteristic rhetorical moves used by Pope Francis and other progressives who are impatient of analysis and argument and wish to get on with modern pastoring, reminds me of what I like to call “A Corollary of Godwin’s Law”: “As an online discussion grows longer, the probability of a comparison of a defender of Catholic tradition to a Pharisee approaches 1.” Perhaps we could expand this to say “a Pharisee or an idolater.” This slight adjustment makes it more interreligious too — surely an important consideration in this age of joint statements from popes and imams. In his article, Fr. Longenecker makes the classic move of the Anglican Newman: wanting to be in the sweet spot of the via media. Unlike the revolutionaries, I love tradition; unlike the traditionalists, I don’t idolize tradition as an unchanging thing. The first problem here is the caricature. Traditionalists fully recognize that liturgy develops over time. However, as with the development of doctrine, they see the development as tending, in broad lines, toward greater amplitude and perfection. So just as we don’t decide to cancel out at some point the Nicene Creed for the sake of going back to the more ancient and pristine Apostles’ Creed, in like manner, we don’t cancel out the medieval and Baroque developments of the liturgy in our search for a more ancient and pristine Christian worship. Pius XII warned against “antiquarianism,” but that became one of the two battle cries of the liturgical reformers — that and their aggiornamentalism, by which everything had to be adjusted and proportioned to the mentality of Modern Man (whoever he is). The second and bigger problem is that the Catholic Newman came to reject the via media approach when he realized that, on some questions, the right answer was found in the “extreme” position, not in the middle position. For example, at the time of the Arian crisis, there were (to simplify things) the Arians, the Semi-Arians, and the Nicaeans. In all the political battles and regional councils, the Semi-Arians were able to position themselves as the reasonable middle between the extremists who denied the divinity of the Son and the other extremists who conflated the Son and the Father by identifying them both as God. In this, needless to say, they showed that they did not grasp, or did not wish to grasp, the position of St. Athanasius and other orthodox fathers, who, though a beleaguered minority, nevertheless held the truth and ultimately prevailed [ii]. So too in our present situation. The traditionalists maintain that there is nothing “traditional” about the Novus Ordo and the rest of the papally imposed liturgical rites from the ’60s and ’70s. Even when the reformers claimed to be “recovering” elements lost in antiquity, the way they went about it was distinctively modern: they took what chimed in with their fancy and filtered out difficult bits that could have been disturbing or distressing to modern audiences. And these men say outright in their articles and books that this is what they are doing; no conspiracy theories need apply. Moreover, they freely amputated and suppressed many extremely ancient features of the liturgy, such as the Pentecost octave and season, Septuagesima, the Ember Days, and the lectionary on which St. Gregory the Great preached in the late sixth century (how’s that for ancient? ), replacing them with innovative and hybridized material fashioned by scholarly brains. Constructivism on this magnitude and with this method is unprecedented in the Church’s history. It is impossible to see what could be “traditional” about this approach or the results. I’m afraid what we are seeing is the result of speaking about such grave matters without the requisite knowledge of details. It is all too easy to say “the Roman rite remains intact” when the only thing one is looking at is an outline of the order of Mass from 30,000 feet in the sky. But the devil’s in the details — and the angels, too, whose role was greatly reduced in the Novus Ordo. Liturgical rites exist not as outlines or abstractions, but as concrete codifications of text, music, rubric, ceremonial, and cast of supporting artefacts. The more one drills into what the classic Roman rite actually is — its ancient ad orientem stance, its particular calendar and lectionary, its more than a thousand orations, its set of Prefaces, its monolithic Roman Canon, the early medieval offertory rite, and so forth — the more one can see how abruptly and comprehensively the Novus Ordo severs itself from that venerable rite. They are, in truth, two different liturgies that share some common elements, somewhat as the Eiffel Tower might be said to share in the verticality of the Gothic cathedral. It is thus more than ironic when Fr. Longenecker cites G.K. Chesterton’s famous words — “Tradition means giving a vote to the most obscure of all classes, our ancestors. It is the democracy of the dead” — when the postconciliar liturgical reform was, of all Church reforms in history, the most autocratic imaginable in its contempt for the collective voice of our ancestors, and democratic only in the sense that it proceeded by way of the voting of “experts” on a panoply of committees that sliced up the parts of liturgy into study groups, like teams of computer programmers testing new operating system modules [iv]. I sometimes think that being a Catholic is like living in a grand old house like the one in Brideshead Revisited. It is an ornate, ancient and venerable structure, full of corridors of memories and alleyways of tradition. The walls are lined with the banners from ancient battles and the ancestors of grand reputation. The attic is full of curious and precious antiques and the kitchens and cellars are full of fine wine, casks of provisions and bundles of equipment for battle and for housework. The gardens are lush and expansive — some formal and fruitful, some still wild and untamed. The modernist would demolish such a house and send the contents to auction. But a Catholic should decide to live there, dust and shine the antiques, clean the carpets, polish the silver, restore the paintings, sharpen the halberds and shine the armor … and then he should draw back the drapes to open the windows and let in the fresh air and the morning light. The last phrase, a deliberate echo of John XXIII’s famous remark about how the Church needs to open her windows and let in the air from the world (how’s that workin’ out for ya, postconciliar Church? ), could be refurbished as a reminder that without the Holy Spirit, without the grace of God, we cannot produce good fruits, regardless of how handsome the tree may be. Fr. Longenecker would be the first to agree, I’m sure, that this interior necessity by no means suggests there is something wrong with the old house and its contents, which the First Cause of all things — the architect and first interior decorator, so to speak — intended to put there by His Providence. It is ironic, again, that our author should choose just this metaphor of the old house and its rambling grounds, since it has always been the traditionalists’ favorite comparison when they wish to describe the result of twenty centuries of gradual development in the liturgy, gently tended by gardeners and janitors. There is no question whatsoever that Archbishop Bugnini and his fellow experts had no patience for this old mansion. They wanted to raze it to the ground and build rational modern flats in its place. 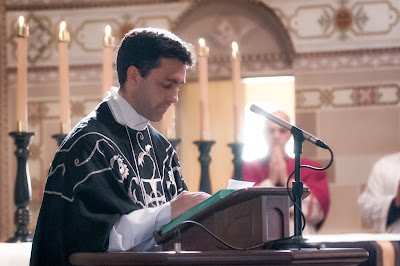 In his own words, Bugnini sought to “rejuvenate the liturgy, ‘ridding’ it of the superstructures that weighed it down over the centuries.” This is why the new missal is so “rationally” ordered, using simple blueprints over and over again instead of the wonderfully unpredictable variety in the old missal [v]. If the formulae change, the rite is changed. If a single element is changed, the signification of the whole is modified. Let those who like myself have known and sung a Latin-Gregorian High Mass remember it if they can. Let them compare it with the Mass that we now have. Not only the words, the melodies, and some of the gestures are different. To tell the truth, it is a different liturgy of the Mass [c’est une autre liturgie de la messe]. This needs to be said without ambiguity: the Roman Rite as we knew it no longer exists [le rite romaine tel que nous l’avons connu n’existe plus]. It has been destroyed. [Il est détruit.] Some walls of the former edifice have fallen while others have changed their appearance, to the extent that it appears today either as a ruin or the partial substructure of a different building. Could Fr. Longenecker’s mention of Brideshead Revisited be a subtle hint to the cognoscenti that he does not, in fact, see eye-to-eye with the liturgical reform? It is well known that the author of this splendid novel, Evelyn Waugh (1903–1966), was fiercely opposed to the dismantling of the Catholic liturgy, conducting a regular correspondence with Cardinal Heenan to see if anything could be done to halt the madness that was beginning to bleed the churches of their congregations, and publishing anguished articles on the subject in periodicals (readers will find all of this in the book A Bitter Trial: Evelyn Waugh and John Cardinal Heenan on the Liturgical Changes). Though he was spared the ultimate indignity of witnessing the Novus Ordo, as he died more than 3½ years before it was rolled off the assembly line, Waugh was utterly horrified by the changes that had been made to the liturgy, which at that point were not insignifcant, but had certainly not become the great tsunami of 1969. Among Catholics who care deeply about the sacred liturgy (and why should they not, when Vatican II calls the “Eucharistic sacrifice” the “font and apex of the entire Christian life”? ), one finds several camps: those who believe that the changes after the Council went too far; those who believe that the changes were not comprehensive and radical enough; those who think that whatever happened happened, and we might as well make the best of it we can today; and those who think that approaching the liturgy with the mentality of progress and relevancy is the wrong way to let it be itself and do what it alone can do and, moreover, a path doomed to self-parody and implosion the more one goes down it. The traditionalist takes the last view. It is based, first of all, on real and repeated experiences of the beauty and riches of the classic Roman rite, against which the impoverished text and ceremonial of the new rite stand out glaringly. There can be no substitute for familiarity. No one who is not intimately familiar with the old Roman rite is in a position to make any global commentary about how it compares with its intended replacement. It is time for those who make out their fellow Catholics attached to the usus antiquior to be actual or potential idolaters to step down from their high horses and walk a few miles in the same shoes, out of charity if for no other reason. Get to know the old rite — not just the Mass, but all the sacramental rites and blessings. See its qualities firsthand, and not from a distance. Such people might be surprised at how different the view is from the ground. They might, indeed, come to see that the danger of idolatry — in the form of an unquestioned, perhaps even unrecognized, adulation of aggiornamento — is more real for those who endorse the Consilium’s modern construction. It was, after all, the attitudes and antics of liturgical progressives that Joseph Ratzinger compared to the episode of the golden calf. One of the disastrous results of the Second Vatican Council is that liturgists, clergy, and religious who were so zealous to make the faith contemporary and relevant, felt that they could best do this not by valuing and re-invigorating the traditions of the Church, but by demolishing them in revolutionary zeal. [i] This hypothesis is based on a more fundamental assumption that I call “Maritain’s Axiom”: “Given the leavening of Greek philosophy, Roman law, Hebrew prophecy, and the Christian Gospel, Europe will develop the finest conscience, most ample respect for human rights, and most consistent rule of law that the world has ever known.” This axiom is true descriptively, in the context of Catholic civilization. It fails prescriptively, in the sense that the outcome is not guaranteed simply from the availability of the ingredients. Yet it is assumed as the basis of, e.g., Pope Francis’s stance on the death penalty. [iv] This comparison, incidentally, was made by Fr. Thomas Reese in an article called “Reforming Catholic liturgy should be like updating software,” in which he compared the old liturgy to DOS and the reform to Windows — with the 1965 interim missal being 1.0, the 1969 missal 2.0, etc. Our latest episode of Square Notes: The Sacred Music Podcast is an interview with NLM’s own Charles Cole about his work with the Schola Cantorum of the London Oratory School and the rôle of sacred music in Catholic education. Back in January 2014, I published an article at NLM entitled “Where Have All the Good Preachers Gone?” In it I noted the general dissatisfaction with shallow and rambling homilies and sermons, and pointed out that the Catholic Tradition is rich with models of excellent preaching. The article recommended three things: first, preaching about Scripture from Scripture, or at least leavening any subject preached on with copious citations of the Word of God; second, leaning heavily on the great exponents of Scripture and the theological masters: the Fathers and Doctors of the Church (not modern exegetes; at least not principally); third, integrating the doctrine, if not the words, of classic magisterial documents such as reliable papal encyclicals. A subsequent article from January 2018, “Preaching from the Propers of the Mass — An Example from Ireland” noted that many great preachers in the old days, and many of the best resources from the healthy phase of the Liturgical Movement, took inspiration from the propers of the Mass: the antiphons, the orations, the lections, the prefaces, and so forth. A few still do (such as Dom Mark Kirby, many of whose homilies can be heard here), but the vast majority, as far as I can tell, simply ignore the texts of the liturgy, which are in fact among the richest texts, doctrinally and spiritually, to preach on. Surely part of the reason for this neglect is that it is not always easy to find the time or acquire the library necessary to prepare such homilies. That is why I am extremely excited to announce a new web resource that places many classic commentaries on the usus antiquior Sunday and Holy Day Masses at preachers’ (and laity’s) fingertips: Sermonry. Sermonry takes the propers of the Mass and puts traditional commentaries right next to them, in a way that’s easy to navigate and a pleasure to read. I think the site will be useful for two groups of Catholics: clergy and laity. My hope is that clergy will find this a useful resource when preparing homilies for Traditional Latin Masses for years to come. A priest to whom I showed an early version of the site worried that if every priest was using this resource, they’d all come up with the same homilies. But that’s unlikely. One priest might preach on the Introit; another, on the Gradual. A priest might preach on three different passages from a single Gospel over three consecutive years. These commentaries will support and enhance what a priest is already trying to do in the pulpit. For the laity, these commentaries can supplement and reinforce what they are receiving every Sunday from the liturgy. For myself I’ve noticed, especially with the Haydock, explanations of particular phrases and customs of the day make it easier to visualize what’s going on in a particular passage, aiding meditation. And having it all right there in one place, I’m not switching back and forth between 2 or 3 books, which helps with focus. Sermonry has a beta label on because it’s not yet complete. Adding commentaries is a time-consuming process. But what’s there is already useful, today. A priest relying on this for homily prep should find commentaries for Sundays and major feasts added a month in advance. Anyone wanting progress updates can sign up on the email list here. Questions? Address them to hello@sermonry.com. This strikes me as a brilliant use of technology in service of tradition. I hope many clergy and laity will take advantage of it. Thank you, Mr. Hawkins, for launching this project. We wish you great success with its development. EXPLANATION The Church very appropriately reads on this day this epistle of St. Paul, in which he exhorts the Christians to make use of the time of grace. A special time of grace is Lent, in which everything invites to conversion and penance, a time, therefore, in which God is ready to make rich bestowal of His graces. St. Anselm says, those do not use the grace who do not cooperate. Let us, therefore, follow St. Paul’s exhortation, and earnestly practise those virtues he places before us, and especially those of temperance, patience, chastity, liberality, love of God and of our neighbor. Let us arm ourselves with the arms of justice at the right and the left, that is, let us strive to be humble in prosperity and in adversity, confident of God’s help. Let us never be led from the path of virtue, by mockery, contempt, nor by persecution, torments, or death. GOSPEL (Matt. IV. 1-11.) At that time, Jesus was led by the Spirit into the desert, to be tempted by the devil. And when he had fasted forty days and forty nights, afterwards he was hungry. And the tempter coming, said to him: If thou be the Son of God, command that these stones be made bread. Who answered and said: It is written: Not in bread alone doth man live, but in every word that proceedeth from the mouth of God. Then the devil took him up into the holy city, and set him upon the pinnacle of the temple, and said to him: If thou be the Son of God, cast thyself down; for it is written: He hath given his angels charge over thee, and in their hands shall they bear thee up, lest perhaps thou dash thy foot against a stone. Jesus said to him: It is written again: Thou shaft not tempt the Lord thy ‘God. Again the devil took him up into a very high mountain, and showed him all the kingdoms of the world, and the glory of them; and said to him: All these will I give thee, if, falling down, thou wilt adore me. Then Jesus said to him: Begone, Satan, for it is written, The Lord thy God shaft thou adore, and him only shaft thou serve. Then the devil left him; and behold, angels came, and ministered to him. II. If Christ, the only Son of God, permitted Himself to be tempted by Satan, even to be taken up on a high mountain, and to the pinnacle of the temple, it should not appear strange to us, that we are assailed by many temptations, or that we should find in the lives of so many saints that the evil spirit tormented them by various images of terror and vexation. This we find in the history of the pious Job, where we also find at the same time, that the evil spirit cannot harm a hair of our head without God’s permission. He does, and is therefore called, in this day’s gospel, the tempter. St. Peter teaches us this, having himself experienced it: Be sober and watch: because your adversary the devil, as a roaring-lion, goeth about, seeking whom he may devour. (I Peter V. 8.) Not all temptations are to be ascribed to the devil, however, they often come from our own corrupt nature, our own incautiousness, or looseness of our senses, by which we expose ourselves to the danger of falling into sin. He cannot; “for as a chained dog,” says St. Augustine, “can bite none but those who go near him, so the devil cannot harm with his temptations those who do not consent to them. Like the dog he can bark at you, but cannot bite you against your will.” Not by force but by persuasion Satan strives to injure, he does not force our consent, but entreats it. Seek, therefore, to subdue your passions and your senses, especially your eyes, and you will either remain free from all temptations, or easily overcome them. “Lord, save me, lest I perish! Lord, hasten to help me!” finally, the sincere acknowledgment of our temptations at the tribunal of penance, which is a remedy especially recommended by pious spiritual teachers. Sung at the imposition of ashes on Ash Wednesday. R. Emendémus in melius, quae ignoranter peccávimus: ne súbito praeoccupáti die mortis, quaerámus spatium poenitentiae, et inveníre non possímus: * Attende, Dómine, et miserére, quia peccávimus tibi. V. Adjuva nos, Deus salutáris noster, et propter honórem nóminis tui, Dómine, líbera nos. Attende, Dómine. Gloria Patri. Attende, Dómine. The responsory in the polyphonic setting of William Byrd.